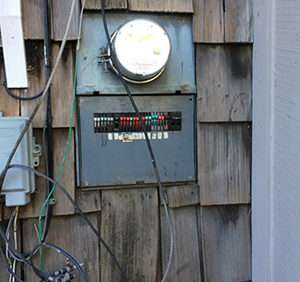 Your electric service panel is the regulator of the electrical current inside your home. When a circuit is being overloaded with electricity, your electric service panel trips a breaker in order to prevent fire, shock, or damage. 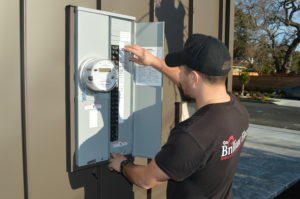 The electric service panel is located inside of the breaker box, which attaches directly to the meter box outside of your home; this is how the utility company feeds electricity to your home. From the panel, smaller power lines extend to different areas in the home. Those lines are labeled inside the breaker box to tell you exactly how much electricity each section can handle at one time. How does my electrical panel protect my home and family? Ground Fault Protection: when electricity travels on an unintended metal surface. Arc Fault Protection: when electricity jumps to form an “arc”. Circuit Overload Protection: when too much electricity is being used at one time. Circuit Overheating Protection: when the heat level from the electrical current reaches a level above average. Direct Short Protection: when two electrical wires touch. Your electric service panel regulates the electrical current inside your home and balances how much electricity each area can handle. When a circuit is overloaded with electricity, your electric service panel trips in order to protect your home from fire, shock, or damage. Our panels struggle to keep up with the high demand of modern technology. It’s important for you to know when your panel is malfunctioning or if it needs upgrading to ensure your home and family stay protected. How do I know if I should replace or upgrade my panel? It’s old:Panels that are 25 years or older are often hazardous, defective, or inefficient and warrant a full electrical inspection. It’s malfunctioning: If your panel trips a breaker frequently, is making crackling sounds, or is radiating heat from inside you should have your panel inspected by the experts at Brilliant Electric immediately. Renovation/Upgrades/Additions: If you are planning a renovation with additional appliances and/or outlets, solar, an electric vehicle charger, or any systems that will require a significant amount of electricity, get an electrical inspection to find out if you need to upgrade your panel. Low-power appliances: If your appliances don’t seem to be operating at their full power you may need to upgrade to a panel with higher amperage. Outdated: If your home has a 60 amp service, two-pronged outlets, a fuse block panel or a split-buss panel call Brilliant Electric to update your panel. Ignoring tripped breakers or a malfunctioning electrical panel can damage your panel and lead to serious hazardous conditions, electrical shocks, and is among the top causes of home electrical fires. At Brilliant Electric we can troubleshoot, correct, or replace your faulty panel.